The Egyptian hieroglyph for the letter "O" is an eye. Stupid Egyptians, I mean seriously, makes you wonder what glyph they used for the word "eye", an "I" perhaps? Heres some papyrus, go make an alphabet, or wait.. wait.. didn't the aliens give you something to write on? I guess not seeing as you take the more efficient route of scratching a stone wall with a stick. "O" is also the last letter of one of my favourite acronyms.. UFO. It stands for OBJECT and it's something I don't get to see. All the OBJECTS I see in the sky are identifyable, and once in my life I want to see something that is UNidentifyable. It doesnt' even need to be flying, it can be sitting in my backyard for all I care, I just need to see a fricken UFO. Maybe someone can dangle an upside down bowl hanging from a fishing rod in front of my window. That would be cool. 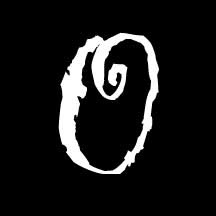 In the Alphabet of the Sublime, "O" stands for "Organism"
"Would you like me to give you an organism?" Bonus Question: Who is this guy and what is he doing? 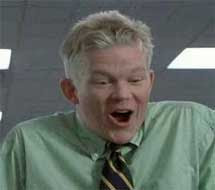 He is Greg Pitts AKA Drew from office space and he is giving is "O" face to a one Peter Gibbons. Man oh man what a great F'ing movie, and a great insight into what to do with a Million dollars. Or as he would put it, "He's riding the bone-roller coaster"